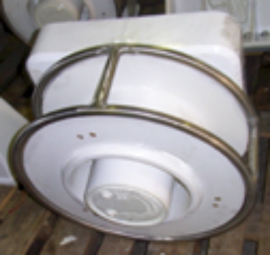 We deliver different sizes of streamer winches. The largest type can be used for 16000m long streamer. The pull capacity can be up to 30 tons at first layer. The control system is designed for an accurate synchro operation of the drums. 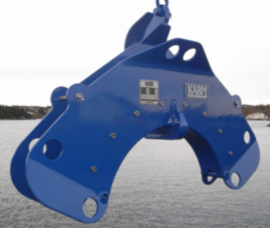 The winches are made compact and of light weight design. he brake system can be delivered with bandbrake or stainless steel disc brake system with intergrated lock bolt. The unit can be designed for use with one slipring or two slipring configurations. 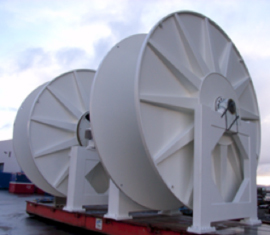 The streamer winches are delivered both as single and double drum configuration. We can deliver the units high pressure hydraulic driven or frequency controlled AC driven. The winches have an encoder for exact speed control and positioning. This is important for synchro operation of different winches. The units can be delivered with static and dynamic tension monitoring system. 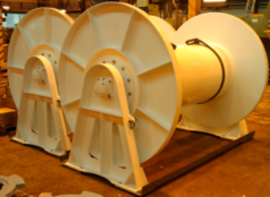 We design and manufacture a wide range of spooling devices for rope and cable. The spooling devices are flexible and can be installed on most types of drums. The spooling devices are high pressure hydraulic driven but can be delivered with frequency control AC drive. Most spooling devices is delivered with a automatic spooling system. This system is operated by touch panel or remote control panel. The spooling system can spool a cable with variation diameter, leadin and streamer cable. The automatic spooling can be adjusted during operation. The spooling devices can be delivered as single unit or double units. 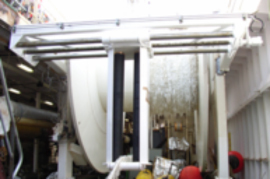 Double spooling units can be independent operated. We can supply horizontal and vertical adjustable spooling devices. We deliver different types of towpoint. These are both telescopic and monobox type towpoint. The towpoint is delivered with different sizes and work radius. The units are designed for remote operation . The towpoints can be delivered with inductive sensors for positioning. These blocks are of special compact design to give support sensitive cable with a large bending diameter. Our aim is that the new block will have less friction and less needed maintenance as the existing blocks in the marked. Spooling blocksWe deliver light weight spooling blocks for handling streamer cable. We deliver different types of storage drums. These drums have a light weight and compact design. The storage drums can be delivered with spooling device. The aux. Winches are compact with capacity between 2—5 tons. Typical units have internal multidisc brake. The winch have a narrow drum to ease spooling. 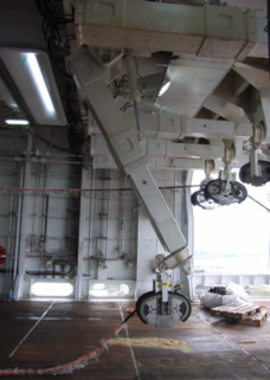 The winch have a flexible foundation to easy installation onboard. We deliver a range of different transvers handling system. This can be auxiliary winches , spooling device or spooling blocks fitted on a transverse railsystem.